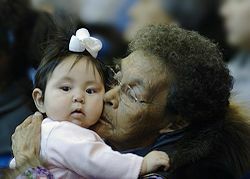 Iñupiaq groups, in common with Inuit-speaking groups, often have a name ending in "miut," which means 'a people of'. One example is the Nunamiut, a generic term for inland Iñupiaq caribou hunters. During a period of starvation and an influenza epidemic (likely introduced by American and European whaling crews, ) most of these people moved to the coast or other parts of Alaska between 1890 and 1910. 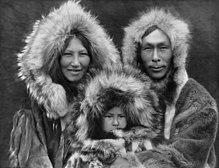 A number of Nunamiut returned to the mountains in the 1930s. Iñupiat people are hunter-gatherers, as are most Arctic peoples. Iñupiat people continue to rely heavily on subsistence hunting and fishing. Depending on their location, they harvest walrus, seal, whale, polar bears, caribou, and fish. 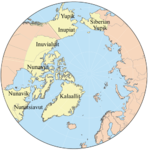 Both the inland ( Nunamiut) and coastal ( Taġiumiut, i.e. Tikiġaġmiut) Iñupiat depend greatly on fish. Throughout the seasons when they are available food staples also include ducks, geese, rabbits, berries, roots, and shoots. The capture of a whale benefits each member of an Iñupiat community, as the animal is butchered and its meat and blubber are allocated according to a traditional formula. Even city-dwelling relatives, thousands of miles away, are entitled to a share of each whale killed by the hunters of their ancestral village. Maktak, which is the skin and blubber of Bowhead and other whales, is rich in vitamins A and C.   The Vitamin C content of meats is destroyed by cooking, so consumption of raw meats and these vitamin-rich foods contributes to good health in a population with limited access to fruits and vegetables. ^ Geraci, Joseph R.; Smith, Thomas G. (June 1979). "Vitamin C in the Diet of Inuit Hunters From Holman, Northwest Territories" (PDF). Arctic. 32 (2): 135. doi: 10.14430/arctic2611.